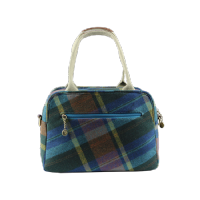 A real handy every day bag from House of Tweed. 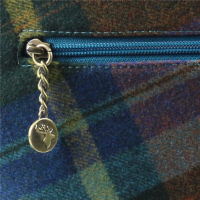 This tote bag in blue and purple mixed tweed has three compartments, the two side compartments have a magnetic fastening and the main centre compartment has a zip fstening keeping all of your valubles secure. Inside the main compartment is fully lined and had two open pockets. 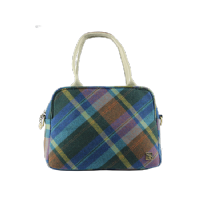 This bag has carry handles but also has a detatchable adjustable long cross body or shoulder strap so can be carried a multitude of ways.